Description: A deciduous or semievergreen climbing vine growing 12 to 15 feet in height. It has paired oval leaves and bares yellow, orange, white, or red tubular flowers followed by red or black berries. Habitat: Honeysuckle is native to southern Europe and the Caucasus. It is now commonly grown in temperate climates throughout the world. 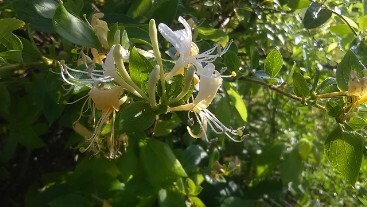 History & folklore: Traditionally, honeysuckle was used as a treatment for asthma and chest conditions. It is believed to have an energy of gentle protection, capable of warding away negativity. Medicinal uses: The bark contains diuretic properties, making it useful as a cleansing herb. It has been used to treat kidney stones, gout, and liver problems. An infusion of the leaves makes a soothing gargle for sore throats and may also help relieve canker sores. The flowers are used as a tea to help relieve coughs and treat asthma. An infusion of the leaves and flowers may also help to bring down fevers. Magical/Energetic uses: In the Bach Flower Therapy system, honeysuckle is believed to counter feelings of nostalgia and homesickness. The honeysuckle plant brings increased energy and is also prized for its sweet scent, which is believed to be useful in seducing a lover. Plant it near a bedroom window to create both protection and romance in your space.